Background: One of the complications following laparoscopic placement of adjustable gastric band (LAGB) is infection of the access port. Patients with ostomy may present as high risk for port infection. We report our experience with LAGB in patients with ostomy. Methods: The ostomy site was packed with povidone-iodine soaked gauze and covered with an adhesive antimicrobial barrier. Patients received 2g of Cefazolin within one hour prior to incision. The access port was placed in the subcostal area, away from the ostomy. Results: Two patients with history of ostomy underwent LAGB. The first patient is a 66 year-old female with a weight of 296 lbs and a BMI of 44 kg/m². She has a history of rectal cancer treated with APR, revision of her ostomy and finally colectomy and creation of ileostomy. Other surgeries included open cholecystectomy and exploratory laparotomy. She underwent placement of LAGB and at 27 months postoperatively her EWL is 67%. The second patient is a 55 year-old female with a weight of 192 lbs and a BMI of 35 kg/m². She has a history of numerous pelvic surgeries for vaginal exstrophy, urostomy creation, revision of urostomy, and vaginal prolapse. She underwent placement of LAGB and at 19 months postoperatively her EWL is 105% and her BMI is 23 kg/m². 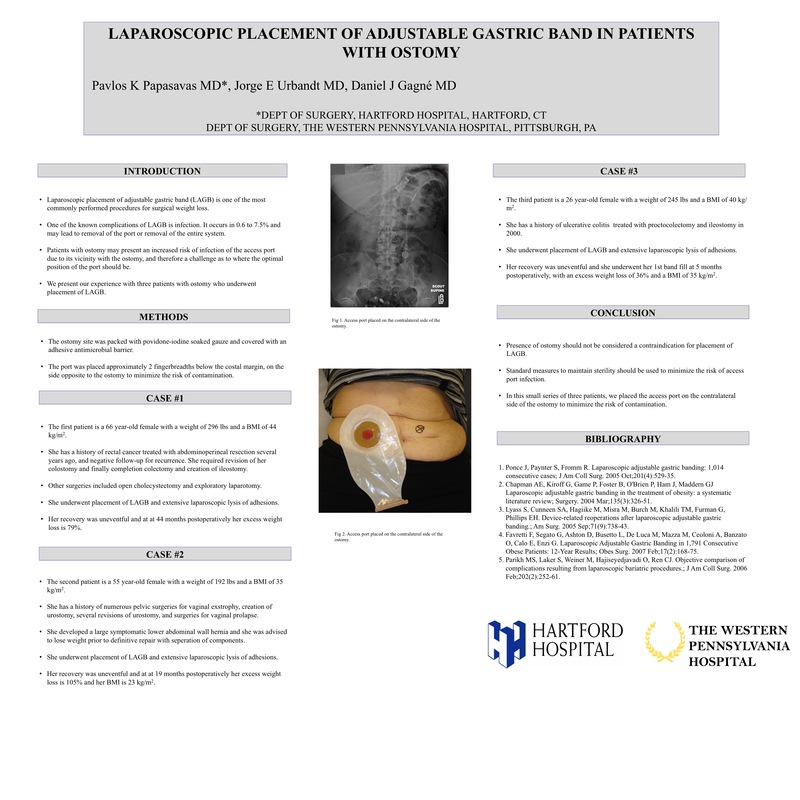 There were no infectious or other complications from the LAGB placement. Conclusion: Presence of ostomy should not be considered a contraindication for placement of LAGB. Standard measures to maintain sterility should be used to minimize the risk of access port infection.